Put the pearl barley into a bowl and cover with cold water. Set aside to soak. Meanwhile, pace the lamb in a large saucepan or flameproof casserole and cover with the cold water or lamb stock. Bring to a simmer and skim off the scum. Add the onion, bay leaf and thyme to the pan. Return to a gentle simmer and cook for one hour, skimming occasionally. 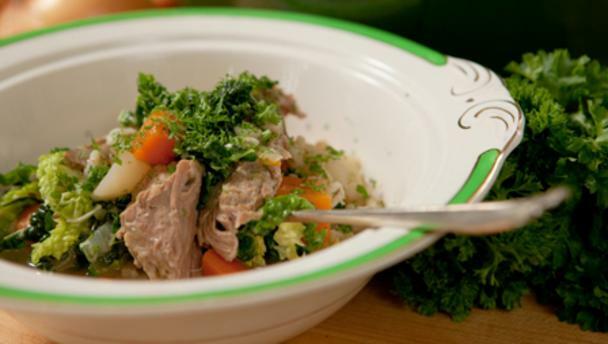 Add the carrots, turnips and celery to the casserole with the lamb. Season with the salt and freshly ground black pepper. Bring to a very gentle simmer, cover with a lid and cook for 30 minutes. After the vegetables and lamb have been simmering for 30 minutes, rinse the pearl barley in a sieve under cold running water. Turn the lamb over. Add the pearl barley and potatoes to the casserole. Cook gently for a further 30 minutes, uncovered. Lift the lamb out of the pot with tongs or a large fork and put on a board. Carve off all the meat, slicing or tearing into largish chunks and discarding any skin and bone. Season the broth with more salt and pepper to taste and spoon into large, deep plates. Divide the lamb between the plates and sprinkle with freshly chopped parsley.